Learn how to complete the relevant settings, create your first quote and send it to a client. As soon as you have completed all of the above settings, you can start sending your clients quotes! When making your first test job, please add yourself as the primary client so you can receive and review the quote to make sure you're happy with everything before creating real ones. 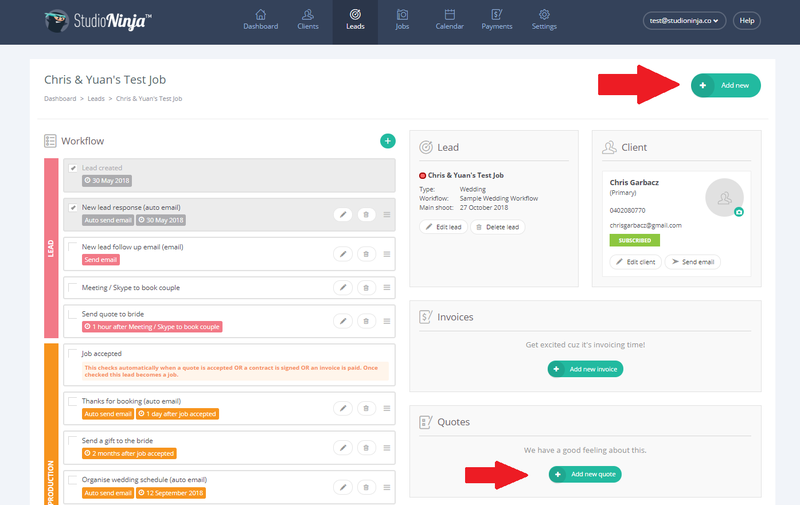 From the job profile page (below), you can either click on the 'Add new' button then choose quote OR click on the 'Add new quote' button in the Quotes box. Welcome to the New Quote page (below). Step 1: Choose your packages from the drop down menu OR create your own by typing in the input boxes. You can add as many package as you want however only one package can be selected. Ninja tip: tick the Recommended box to sell your package/service. Add a product (add-ons) from the drop down menu OR create your own by typing in the input boxes. Your clients can select/add multiple products. 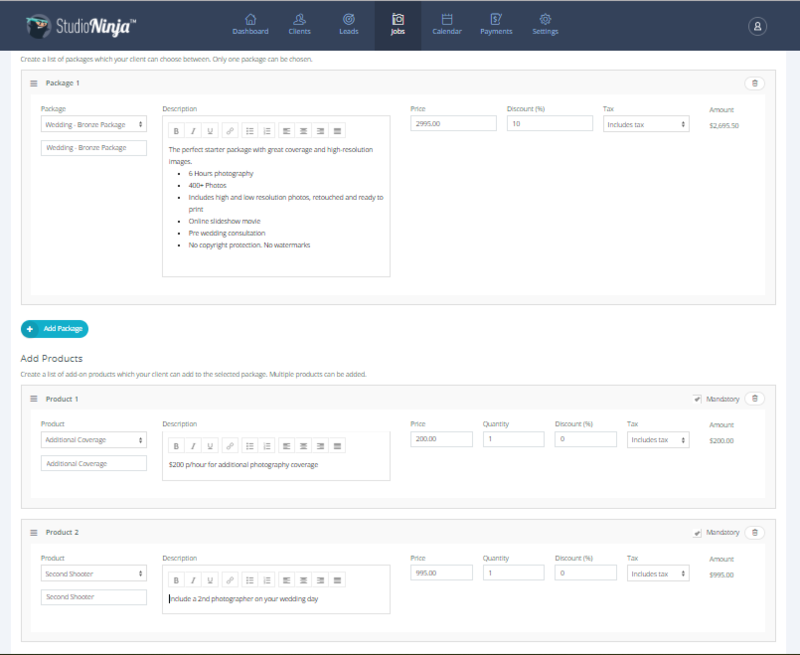 Ninja tip: you can tick the Mandatory box so your clients can't deselect the product and change the quantity. Step 2: If you like to add a discount. You can either apply a percentage discount per package/product OR apply a fixed discount by adding it as a negative product with a negative value. Step 3: Select a payment schedule from the drop down menu. Step 4: Choose to attach a contract to this invoice. Leave it blank if you don't want to attach a contract. Step 5: Choose to attach a questionnaire to this invoice. Leave it blank if you don't want to attach a questionnaire. Step 6: Click the 'Save quote' button. Send Quote: By clicking here you can email your quote to your client. Preview: This will allow you to preview the quote within the Client Portal. Edit: Allows you to go back into the quote and make any changes you like. Save as PDF: You can save our quote as a PDF. Delete: Lastly, you can delete the quote. If you are happy with everything, click the 'Send Quote' button and the Send Quote lightbox will appear. By default the Quote Email Template will appear so if you're happy with the text, all you have to do is click the 'Send quote' button. Feel free to make changes to the body text of this email to make it sound more on brand or permanently make changes to this email by going to Settings > Email Settings & Templates and editing the Quote Email Template. Go and check your email. Open it and click the link that says 'Please view your quote online by clicking here'. You will be taken to the client portal. 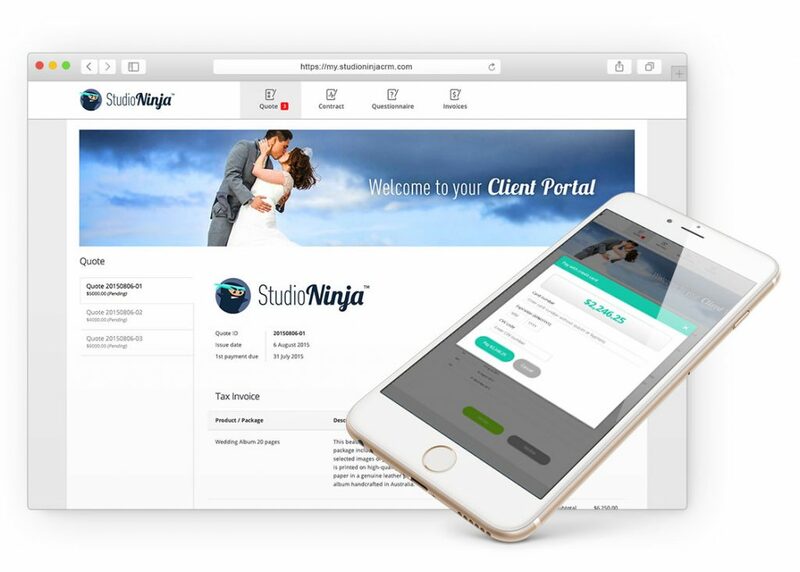 This is what your clients will see and this is where your clients will pay invoices, accept quotes, sign contracts and complete questionnaires. What happens when a quote gets accepted? An invoice will automatically be generated. The job will automatically go from Lead Stage into Job Accepted stage. You can see that the Job Profile page looks different now. Congratulations, you've just setup, created and sent your first quote. It's now time to start adding real quotes into Studio Ninja!